Once tagged each object basically gets its own webpage allowing comments to be placed, new media added such as YouTube clips, Audioboo, Vimeo etc and new tales tagged to the codes. An interesting take on this is that once these tags are placed in the wild and scanned with the free iPhone app they become read/writable and therefore location aware. As such any object you tag with the site can ‘Tweet’ each time it is scanned. If you tag a landmark for example, each time that tag is read you can get a tweet that says ‘Hey, I’ve just been scanned’. 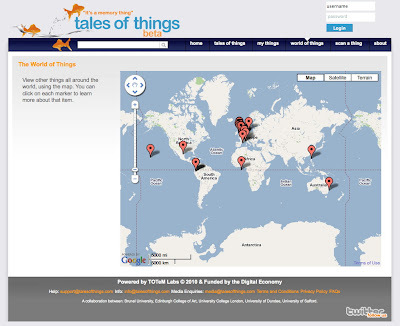 Once scanned new tales or comments can be added to that tag, creating a social network of ‘things’ and ‘locations’. I love this! So beautiful! Is this project free to use/distribute as well?